2. Click on Edit and select Preferences. 3. You may need to click on the + sign next to "Mail & Newsgroups" to see the options. 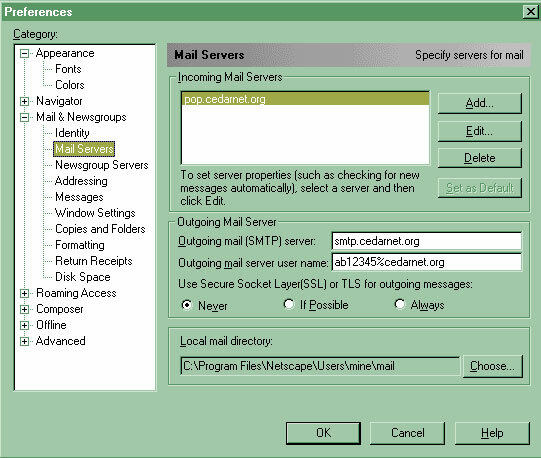 Then select "Mail Servers", and it should display the options in the figure below. 4. Fill in the blanks for "Outgoing Mail Server"
5. 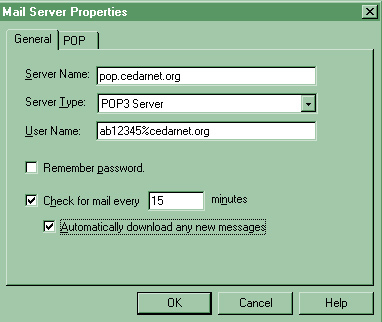 In the big white box under "Incoming Mail Servers", highlight your CedarNet mail server (you should have "pop.cedarnet.org"), then click on the "Edit" button to the right. 6. Make sure the "Server Type" selected is "POP3 Server". If not, click on the drop arrow to select it. 7. Fill in the other blanks. Place a check in the box next to "Check for mail every 15 minutes". Place a check in the box next to "Automatically download any new messages"
8. Click OK twice to save all settings and get back to your inbox. 9. Click the "Get Msg" button (upper left-hand corner) to begin downloading your email from the CedarNet mailserver.